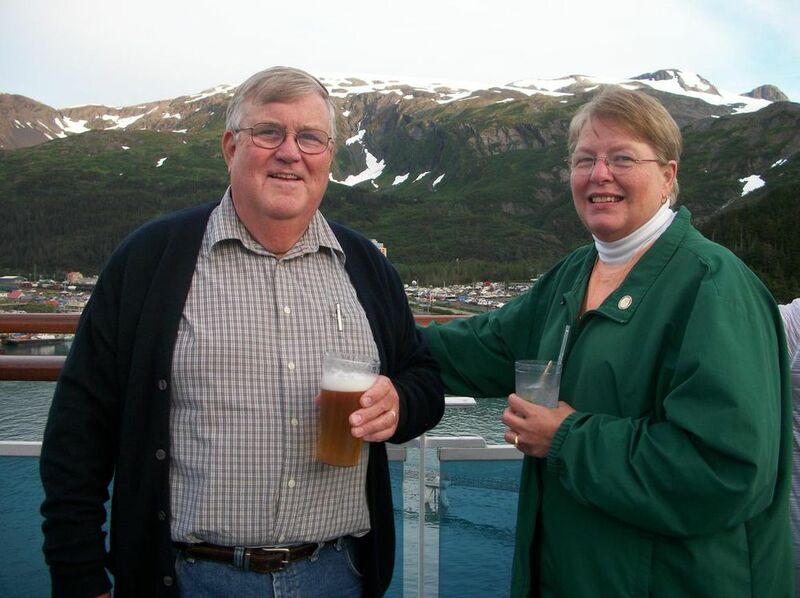 "Our Alaska trip was WONDERFUL! I could not have asked for a better experience. All in all this is probably the best vacation we have ever taken. Joanne, your gift of wine made our formal night dinner even more special. Thank you so much for helping us make this trip the wonderful experience it was." Ron and I having a toast as we sailing out of Whittier. As you can see, it was a lovely evening. Our Alaska trip was WONDERFUL! I could not have asked for a better experience. The inland portion of the trip was just gorgeous with lots of fall color in Denali Park. The weather was great and we had very good views of Mt. McKinley on our trip from Fairbanks to the Denali Princess. Ron and I both fell in love with Alaska. Princess did a great job with all the logistics of the trip. Luggage was picked up and delivered flawlessly and our accommodations were comfortable at each stop. The bus trips from Fairbanks to Denali and from Denali to the McKinley Princess were good but the train trip to Whittier was really special. Good weather contributed to the experience but the train itself was very comfortable with a guide on board and excellent service. We saw glaciers, wildlife and whales – all from the comfort of our train. The cruise was even better than we expected. Having a naturalist on board was a real plus, as were the National Park Rangers who joined us in Glacier Bay. Watching the glaciers calve was truly an awe inspiring experience. Service, accommodations, dining and entertainment on board the ship were all excellent. We enjoyed our shore visits in Skagway, Juneau and Ketchikan. Each community has its own history and personality. All in all this is probably the best vacation we have ever taken. Alaska is a national treasure that I will recommend to anyone who has not already visited. Princess does a great job showing off the wonders of Alaska. Joanne, your gift of wine made our formal night dinner even more special. Thank you so much for helping us make this trip the wonderful experience it was.